I take great delight in reviewing Ocean Voyager because its director, Judson Rosebush, and I have been good friends for many years. Judson, some of you will recall, was one of the pioneers of computer animation in the 1970's. He did many of the animations in the Disney classic, TRON. He is also the co-author of the best-seller Computer Graphics for Designers and Artists, now in its second edition from Von Nostrand/Reinhold. Ocean Voyager follows in the tradition of Judson's innovative work in graphics and multimedia. Ocean Voyager is an undersea exploration game that casts the 8 to 13 year old player as captain of the submarine, the Sea Scout. The captain's goal is to return Arpo the seal to its rookery and to free the adjoining bay of poison. A worthy goal of any 8 to 13 year old. 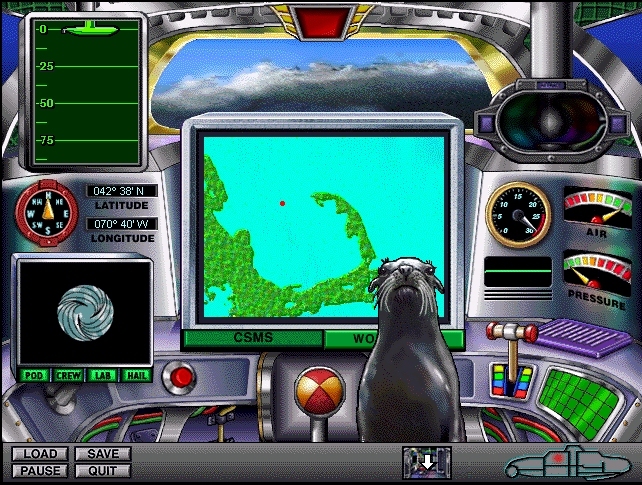 The screen shot below shows the bridge of the submarine with the standard operational metaphors - graphical joystick, sliders, toggles and the like. Snaphot from the Sea Scout. Ocean Voyager is one of the new-wave cd-roms for kids that eschew the monotonous blood-and-gore fare for more cerebral pursuits. This is a non-trivial undertaking however. Today's children tend to equate computer games with violence. Ocean Voyager, like Wyatt Earp's old West (see my review in the last issue of PC AI), show that action and excitement need not be gory. What is more, the player can actually learn something besides new ways to punish their siblings. Imagine that! The mix between the interactive gamery and the presentation of information is about all that one could expect from a popular game. The information content comes through via talking heads and traditional text+graphics formats in just about the right ratio, the latter available through the ship's library. The content seems reasonable for the age group, including information on fishing gear, ocean explorers of the past, a chapter on submarines from an issue on Popular Science for Kids, indexed information on environmental pollutants, and much more. In addition, Ocean Voyager includes Video clips on El Nino, thermal vents, and hurricanes and an interactive digital robot for exploring the deep. I am not alone in my praise for this cd-rom game as Ocean Voyager won the Silver Medal at the 1995 Interactive Multimedia Competition. This is a masterfully assembled CD. Highly recommended for children in this age group and their parents as well.